1. These Australian Opal Rings are so so pretty – like wearing a little piece of a mermaids tail on your finger. They have been on my ‘Things I want’ pinboard for such a long time, maybe it’s about time I committed and bought them. 2. New phone, new phone case! I picked up the Samsung S7 Edge last month and whilst I like the case I have on it al the moment this gold and aqua bad boy is calling to me! If you're looking for an S7 Edge case, this comes in loads of colours! 3. I love this perfume but I can’t decide if it smells too much like a friend of mine for me to wear it too (do you have that problem with perfumes if they are your friends ‘scent?’) so a handbag sized rollerball would give me a chance to find out! Plus I just love rollerballs for a pop of on the go scent. 4. How beautiful is this bottle of gin? I’ve not been up on embracing the copper trend that’s swept the world, but for this gin, maybe I’d allow a little bit into the house. It'd look perfectly at home in my bar, and in my gin goblets I think! 5. I bought some of these Sperry pumps last summer and they are just so comfy. My current ones are bright pink and flowery, so maybe another pair is required for this summer, just so they can work with every outfit, don’t you think? 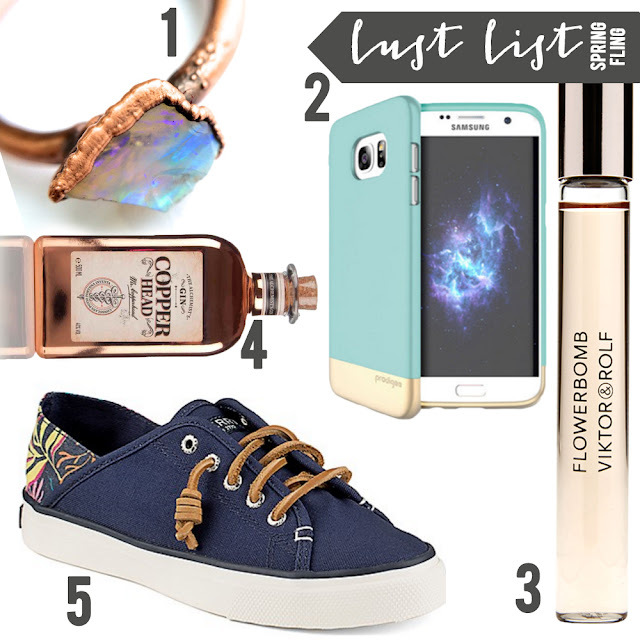 What is on your spring lust list? Tell me what you're coveting.